Ten days after its premier in 1980, the director of CANNIBAL HOLOCAUST Ruggero Deodato was arrested and charged with obscenity. The charge was amended to include murder following suspicions that the crew actually killed some of the cast of the film in order to obtain grim footage, most notably the scene in which a young girl is seen impaled on a large wooden stake. Deodato was forced to produce evidence that the effect was fake (which he did) and the charge was later dropped. I love this story! It was the era of the video nasty and films like this were difficult to get hold of in the UK thanks to the brutal censorship of James Ferman's BBFC. But us kids always managed to find a bad pirate copy on Betamax thanks to making friends with the dodgy geezer in the video rental store who kept "the good stuff" under the counter. The story of Deodato's arrest was legendary and Cannibal Holocaust was a MUST SEE film! I do have a very distinct memory of seeing this film for the first time. I must have been about 13. It was a shocking, sick film, very realistic (and it still holds up well today). 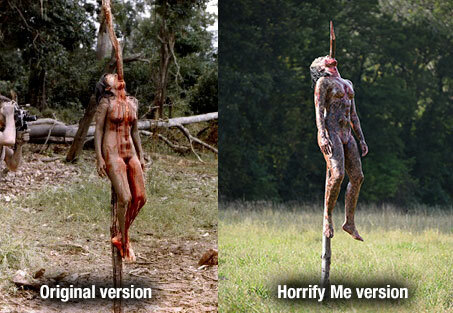 The impaled girl did look completely real and was shocking. I've been wanting to do a shoot of the impaled girl for quite some time. It's well known that most of my photography is embellished with a lot of digital editing in Photoshop afterwards, but I really wanted this one to be raw, authentic, and with as little Photoshop work as possible. It had to be done the same as the film - which meant attaching a bicycle seat to a post and asking the model to sit bolt upright with a piece of wood in her mouth pointing upwards. In theory, the effect is very simple to do, but in practice, not so simple. There was risk of actual harm to the model in this shoot if I wasn't careful, and I certainly had no desire to ruin my perfect safety record. So I conducted a full risk assessment for this shoot, and even gave the model a safety brief before we started. The obvious risk was falling. Although it wasn't a huge distance to fall, with a pointy stake in her mouth the injury could have been catastrophic. But we discussed a method of dealing with this (basically, she was to throw the mouth stick to the ground at the slightest hint of a wobble) plus I had crew close by at all times to keep her safe, and asked her to come off the prop after short bursts so that she didn't have to sit on it for more than a few minutes at a time. I also ensured that the post was planted very firmly into the ground and was solid, and the bicycle seat was secured with a custom bolt that I had specially made by an engineer which kept it solid and safe. And of course, the actual timber was well seasoned, strong, and capable of holding more weight than it needed to. For such a simple effect, there was a lot to consider in order to do it safely. The result was a set of images that I hope match the authentic and realistic feel of Deodato's original. Considering I did this exactly the same way that he did, I saw the same vision in front of me that he saw on set - and seeing this set-up in the flesh is disturbing! When Harley (the model) was performing, the image of a body impaled is truly creepy and frightening. Being able to walk around it and photograph it was weird! Normally on shoots like this I'll Photoshop the hell out of it and create the illusion digitally, but here I had the real thing in front of me and it was an insane thing to behold. This is a dream shoot for me, and something I have wanted to do for a long time. Fittingly, it's come together on the 35th anniversary of the film and at Halloween time too!